Guernsey with its capital is located in Europe (Western Europe, islands in the English Channel). It covers some 79 square kilometers (about one-half the size of Washington, DC) with 66,502 citizens. English and French are the languages commonly used by the people in Guernsey. This country shares no land borders with another country. Guernsey is a group of islands in the English Channel, part of the Channel Islands. There are no trains on the island; roads are small but not busy. The island is 6 miles long x 3 miles wide, so a bicycle is a good way to get around. Alternately there are hire cars available, taxis and a frequent bus service during the day. The other Channel Islands can all be reached by ferry from St Peter Port. Jersey and Alderney can also be reached by plane. The landscape is mostly flat with low hills in southwest. The average density of population is about 853 per km². The climate in Guernsey can be described as temperate with mild winters and cool summers with about 50% of days are overcast. Potential threats by nature are very large tidal variation and fast currents can make local waters dangerous. To reach someone Guernsey dial +44-1481 prior to a number. The local cellular networks are operated on 900 MHz, 1800 MHz, 3G, 4G. Websites typically end with the top level domain ".gg". If you want to bring electric appliances (e.g. battery chaarger), keep in min the local 230 V - 50 Hz (plugs: C, G). The sign for the locally used currency Pound is GPD. 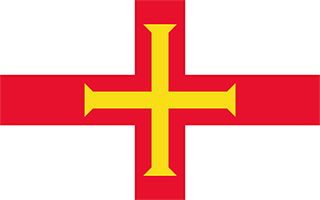 White with the red cross of Saint George (patron saint of England) extending to the edges of the flag and a yellow equal-armed cross of William the Conqueror superimposed on the Saint George cross; the red cross represents the old ties with England and the fact that Guernsey is a British Crown dependency; the gold cross is a replica of the one used by Duke William of Normandy at the Battle of Hastings. Guernsey and the other Channel Islands represent the last remnants of the medieval Dukedom of Normandy, which held sway in both France and England. The islands were the only British soil occupied by German troops in World War II. The Bailiwick of Guernsey is a British crown dependency but is not part of the UK or of the EU. However, the UK Government is constitutionally responsible for its defense and international representation. The Bailiwick of Guernsey consists of the main island of Guernsey and a number of smaller islands including Alderney, Sark, Herm, Jethou, Brecqhou, and Lihou.